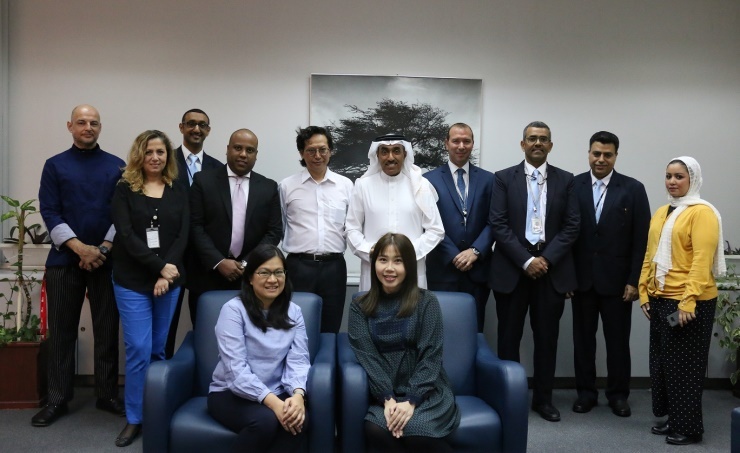 Manama, Jan. 9 (BNA): Bahrain Airport Services (BAS) received a delegation from Cathay Pacific Airlines, after BAS catering services received the golden award. Salman Al-Mahmeed, CEO of BAS said: "We are proud of our positive relations with our customers, and we are constantly developing and improving BAS services in line with international standards, Especially that these successes are reflected positively on the reputation of the Kingdom of Bahrain in the aviation sector and airport services." He pointed out that the company's catering annually prepares more than 6.5 million meals. It has received numerous awards and accolades at international levels, attracting many local and public clients. "Catering services at BAS are fully compliant with the International Health and Safety Standards (HACCP) and are also ISO 22001 certified," said Masallam Al Nabulsi, Senior Manager, Catering Services. He added: "This recognition by Cathay Pacific is proof of the quality of performance that the team is responsible for the management of supply, which is credited with access to the centers of excellence and positive reputation of the company." The Cathay Pacific Aviation delegation praised BAS’s efforts at catering. Cathay Pacific Aviation is one of the world's leading airlines, serving more than 46 destinations worldwide.